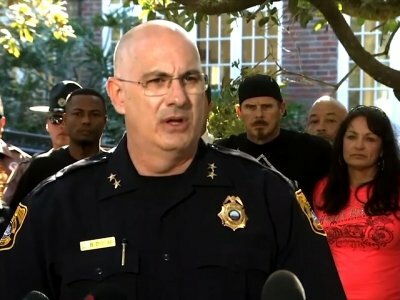 TAMPA, Fla. (AP) — After enduring almost two months of fear, a Tampa neighborhood breathed a sigh of relief Wednesday after authorities announced the arrest of a suspected serial killer, a recent college graduate who police say gave himself away after asking a co-worker to hold a bag containing a handgun. Howell Emanuel Donaldson, who was working as crew chief at a McDonald’s, was charged with four counts of first-degree murder in a string of shootings that targeted people near bus stops. Neighbors of the 24-year-old — who lived in a different area of Tampa than where the slayings took place — said they recently saw him playing basketball with his younger brother in the driveway of the family’s suburban home. Now they’re watching news of him on television, puzzled as to how a kid who went to college in New York on a basketball scholarship ended up behind bars. Arrest records did not list an attorney for Donaldson, and the police chief said he did not know if the suspect had a lawyer yet. He’s scheduled to make a first court appearance Thursday in Hillsborough County. The arrest, which happened Tuesday night, brought immense relief to the anxious neighborhood of Seminole Heights, which had stopped many outdoor activities since the first death on Oct. 9. Two more fatal shootings happened in the weeks that followed, and residents were so scared that police escorted children while they trick-or-treated. The fourth killing happened earlier this month. “I think in this situation it’s a lose-lose no matter how you look at it, except for a magical thing like when a community — organizations, law enforcement — come together unified and can put somebody behind bars,” said Brittany Lott, who said she has not walked her bulldogs in 51 days, choosing to spend time in the backyard instead. The crack in the case came Tuesday when Donaldson brought a bag holding a loaded Glock .40-caliber handgun to McDonald’s and asked a co-worker to hold it while he went across the street, authorities said. Restaurant workers thought Donaldson’s request was odd. When he left, they reported the gun to a police officer who was doing paperwork there, setting off an investigation. When he returned to the restaurant, officers were waiting. In addition to matching shell casings found at the shootings, authorities said location data from Donaldson’s cellphone put him at the scene of at least three of the killings. “The gun is what we needed,” Police Chief Brian Dugan said at a news conference surrounded by family members of the victims. Donaldson did not live in the neighborhood where the shootings occurred and told investigators he was unfamiliar with it. Robert Hoffa, the uncle of victim Monica Hoffa, said he was “overjoyed” when Tampa police called him to say they had made an arrest. “This is about family. This is about community. This is about everybody sticking together,” he said. Authorities have not been able to determine why Donaldson chose the Seminole Heights neighborhood. Although he’s been cooperative and friendly to officers, the suspect did not shed any light on his motive or why he targeted individual victims, the police chief said. Donaldson graduated from St. John’s University in New York in January. He was a walk-on for the men’s basketball team during the 2011-12 season but never played in a game, school spokesman Brian Browne said. After graduating, he worked in customer support at the Ultimate Medical Academy, a school that trains workers for health care jobs. He started there Feb. 13 and worked for about three months before being fired for absenteeism. The academy said he passed a background check before he was hired. His LinkedIn account also listed a job as a “guest experience host” for the New York Mets in 2016. The Mets would neither confirm nor deny that he was employed there. Police in New York said Donaldson was arrested in May 2014, but the arrest was sealed and no details were available. Authorities planned to review cold cases to see if Donaldson could be linked to any crimes there. Donaldson bought the gun and a 20-round box of bullets from Shooter’s World in Tampa on Oct. 3. He picked it up after the four-day waiting period, and the first killing happened two days after that. The arrest report said police found clothing inside Donaldson’s car that was similar to what was worn by a person spotted in surveillance video taken the night of the first shooting. Residents and police had been on edge since Oct. 9, when 22-year-old Benjamin Mitchell was shot to death. On Oct. 11, 32-year-old Monica Hoffa was slain, followed on Oct. 19 by 20-year-old Anthony Naiboa, who was killed after taking the wrong bus home from his new job. The final victim, 60-year-old Ronald Felton, was killed Nov. 14. All of the October victims were either getting on or off a city bus, or were at a bus stop when they were shot, police said. Contributing to this report were Associated Press writers Freida Frisaro in Miami, Kelli Kennedy in Fort Lauderdale and Colleen Long in New York, as well as AP news researcher Rhonda Shafner, also in New York. An earlier version of this report had an incorrect spelling for the name of the Seminole Heights neighborhood.